That’s Esther hiding on the left and Xerxes on the right. The tank decorations were Corin’s choice. He is thrilled with our new pets. Yesterday morning, he came out to discover that daddy had brought home the centerpiece from a Chamber of Commerce awards dinner: a vase containing two frightened-looking goldfish. His ecstatic response was, “This is a real surprise. I never expected to have fish as pets.” A trip to PetSmart and $100 later, we were equipped for the newest lives depending on us for survival. We’ll see how we do. Goldfish are not exactly known for their hardiness. 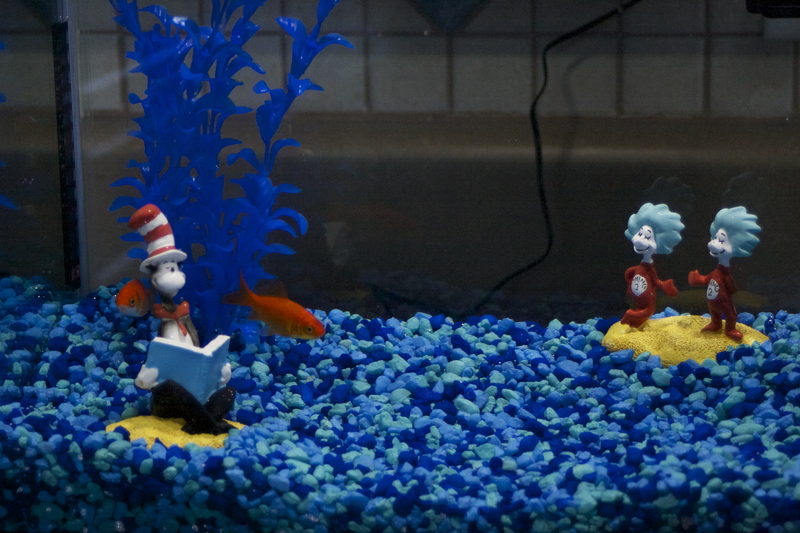 This entry was posted in Uncategorized and tagged family pets, goldfish.